I am restoring a PolyMoog Keyboard. 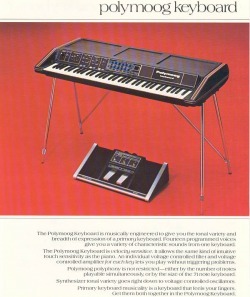 It is commonly known as the most unreliable keyboard of all time (1st equal with the Mellotron). It takes two strong roadies to lift the foot pedal alone. It was mostly going when I got it a few years ago from the back of a Wellington music shop, but just as I was perfecting my Gary Numan parts on the Vox Humana preset, the power supply died. ​Update: the restoration process (which had stalled for about 20 years!) really is now underway. The power supply has been repaired, and it is making some sounds again. Lots of faults still to fix, and I intend to document the repair process. Update 2: success! my research paper on this project can be found below.